Opera TV announced today a recognition for business success and organizational leadership by E24, the largest online business newspaper in Norway. The award was handed to Opera TVs CEO, Aneesh Rajaram in two categories – the Leader of the Year for 2016 and the Digital Rethinker Leader category, both part of E24’s annual Leader Talent Award Process, now in its 8th year.Aneesh was chosen from amongst several hundred short-listed candidates, who were evaluated through a very rigorous process that was run by a highly accomplished jury, and involved independent evaluations from external sector experts and leading executive search firms. 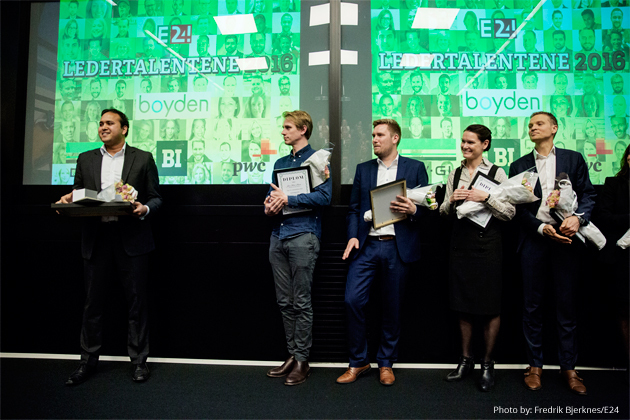 Recipients of the various Leader Talents awards were announced at an event held on November 18 at the PWC building in Oslo. More information about the award and full list of all participants and jury can be found here. For the past 3 years, Rajaram has been leading Opera TV, a wholly owned subsidiary of Opera Software ASA, and under his leadership the company has witnessed tremendous growth, now employing nearly 200 people in 14 countries, and doubled its annual income through a largely expanded customer base and product portfolio. In his role as CEO of Opera TV, Rajaram is responsible for the overall business, including overseeing the company’s sales and business development, marketing, engineering and product management, among other responsibilities. Rajaram received his Bachelors in Engineering from Visvesvaraya Technological University in Bangalore, India and his MBA from London Business School. The Opera TV ecosystem is now the world’s largest unified platform for connected TV devices spanning more than 40 million devices shipped each year. Opera TV solutions include Opera TV 2.0, a next-generation OTT platform; Opera TV Snap 3.0, a complete end-to-end OTT app generator for broadcaster, content providers, and video on demand (VOD) services; Opera TV SDK, a platform for creating and rendering HTML5-based user interfaces; and the Opera TV Store, an OTT experience for consumers, bringing more than 1,000 apps to major OEM brands and pay-TV operators. Unlike individual OEM or operator platforms, the Opera TV platform evolves quickly to keep pace with market requirements, supporting the complex needs of demanding OTT services. Opera TV is the market leader in enabling the TV industry’s transition to OTT. The Opera TV portfolio powers rich web experiences on tens of millions of Smart TVs, set-top boxes, Blu-ray Disc players and chipsets for more than 60 customers. The Opera TV ecosystem spans the Opera TV Store app platform with hundreds of entertaining apps tailor-made for TV, the Opera Devices SDK (software development kit) for creating and rendering HTML5-based user interfaces including optional modules to enable HbbTV, the Opera Media Streaming Module, to manage the rapidly changing global OTT streaming requirements, and the Opera TV browser for reaching the full web. Opera TV offers solutions for OEMs, pay-TV operators, broadcasters and content publishers. Visit www.opera.com/tv to learn more.